"It’s funny, because I will have people say to me, “Well, I don’t want to buy that record, because I don’t know if it’s going to be a band”. Well, maybe if you buy the record first, it might become a band!" 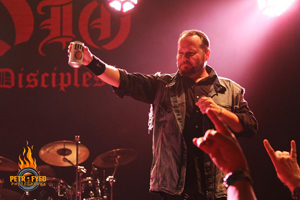 TIM ‘RIPPER’ OWENS is no stranger to KNAC.COM readers. He was discovered by JUDAS PRIEST drummer SCOTT TRAVIS while performing in a JUDAS PRIEST tribute act. Travis would pass on a video tape [remember those clunky things?] of Tim to guitarist GLENN TIPTON and he was auditioned for the vacancy left by singer ‘The Metal God’ ROB HALFORD. Owens went on to record two studio albums with JUDAS PRIEST, Jugulator  and Demolition , then two live albums. After his time in PRIEST came to an end Owens spent some time with ICED EARTH and went on to a landmark record with the band, The Glorious Burden . More touring and recording followed before Owens went out on his own, released a solo album, then an album with BEYOND FEAR and worked with YNGWIE MALMSTEEN on a pair of records. Tim was doing some press and spoke with KNAC.COM about his new project THE THREE TREMORS featuring SEAN PECK [CAGE] and HARRY CONKLIN [JAG PANZER], who have an album due on February 15th], amongst other things. KNAC.COM: Tim, who approached who first about THE THREE TREMORS? OWENS: Sean [Peck] approached me about it a few years ago. As you know I do a lot of touring and a lot of things, usually performing the back catalog, but Sean wanted to make an all original record. Sean and I go back a few years, he opened for JUDAS PRIEST around ‘98. We wanted to make a record that wasn’t commercial or contemporary. We wanted to create a ‘true’ power metal record, something with high notes, power vocals and I think we achieved that. KNAC.COM: How long has it been since this has been gathering steam? Has this album been in the can for a bit? OWENS: I don’t know how long ago that he had this in mind and was working on ideas. I think since we spoke and started working on ideas, I would say it’s been at least roughly two years. Things moved really quick once he started sending me stuff to sing to. What we did is that he had everything written and recorded, and he would send me the tracks and I sang over the entire record. All three of us [the singers] sang through the entire record, we moved quickly because of our schedules. My schedule is just crazy! KNAC.COM: How many liberties were you given when recording your vocals for the album? OWENS: Yeah, he let me do what I do, but we wanted to stick to the melody that was already there. I had just written a record with a band called SPIRITS OF FIRE, with CHRIS CAFFERY, ROY Z and STEVE DIGIORGIO, so I wasn’t really in a frame of mind to write another record that soon. What was great was that my voice was in shape from working on SPIRITS OF FIRE and I was able to sing in different voices that I don’t always sing in. I used a lot more falsetto, raspier voices for THE THREE TREMORS. It’s a METAL CHURCH raspier voice, so it was kind of cool to sound different on the album and not to sound like the other guys. We didn’t want to have three singers that sounded exactly the same. I think it will be very interesting to release three individual versions of the album, I think mine would be be very different because I used a lot of different voices on it. 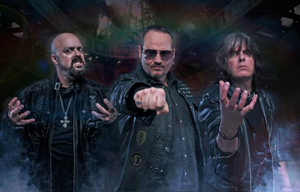 KNAC.COM: THE THREE TREMORS was thrown out there at one point by BRUCE DICKINSON, ROB HALFORD, and GEOFF TATE, several years ago when they toured together. They toyed with the idea of doing something together and wanted to call it THE THREE TREMORS. Was there any apprehension to go with that name? KNAC.COM: You’re touring behind this, I imagine you’re going to perform the entire album? OWENS: We are. We’ve already toured once through Europe in October , as the album was originally scheduled to be released in October. We did 17 shows in Europe and no one had even heard the record! We did the 12 songs from the record on that tour. It’s going to be great to tour behind this album in America. I think this album and tour will go over well here. WWe’ll do the songs from the album and we’ll do some songs from my back catalog, like “Scream Machine” and “Burn In Hell” from JUDAS PRIEST and then we’ll do a couple CAGE songs then a couple JAG PANZER songs. It’s going to be a fun, in your face metal show. KNAC.COM: What was it for you guys to go to Europe do an entire tour with no album released? Sure there’s some lyric videos, but that must have been wild to do shows where the fans knew all your past bands and projects but didn’t have the album, because it wasn’t even out yet. OWENS: Like you said, they were familiar with a couple of songs from some videos and some clips we threw out there to appease people with. We took that chance, but I think what it showed was that were in it for the right reason. We’re not going release this album, tour and just play stuff from each of our histories. This is why we started this band, to do the album live. We do these tours, we play a lot of clubs, some big venues and some smaller venues, you go from one place to another and you learn how to do this, because we’re all on stage at the same time. We don’t take turns going up on stage, so we’re on there all night long. It was great, a good time! KNAC.COM: SPIRITS OF FIRE, I read about that band and album, will this be a full fledged band? KNAC.COM: I’ve heard people that talk about not buying albums because the band won’t tour or even play a show. I always go back to KXM which features GEORGE LYNCH [DOKKEN, LYNCH MOB], DUG PINNICK [KING’S X] and RAY LUZIER [KORN, DAVID LEE ROTH]. They haven’t played a show and are working on their 3rd album. They’ve shattered that mindset. OWENS: Let me tell you my feeling on this thing, because you know there’s people that know everything music out there that are always offering me tips on how to run my career! [laughs] They’re like, “Tim you need to be in one band”. Well, if I were in one band, I would be working a 9 to 5 job 50 hours a week to pay my bills! [laughs] I’m a musician, this is ‘my job’. So if I was a fan of music or of GEORGE LYNCH, DUG PINNICK, I’d want to get all of their stuff! If ROB HALFORD put out a solo record, a FIGHT record or a JUDAS PRIEST record, I’d be all over those records! Why? Well, because I’m a fan. Right now, I’m working a straightforward rock ‘n’ roll record with a band who is contributing the proceeds to military veterans, I’m in. That will be totally different than anything I’ve done before. I love to sing, it’s what I do and it’s what I will continue to do. 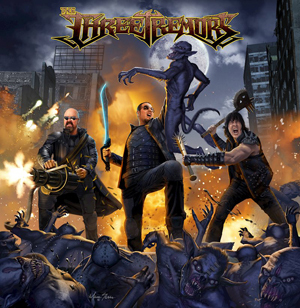 I can say with all certainty that I will be part of another album by THE THREE TREMORS and there for sure will be another SPIRITS OF FIRE record. KNAC.COM: DIO DISCIPLES seem to take the high road when it comes to some of the controversial stuff. Do you think DIO DISCIPLES and LAST IN LINE can co-exist? OWENS: Listen, I’m a fan of DIO and I’m a fan of the records that the LAST IN LINE guys performed on. Listen, we’re both celebrating RONNIE [JAMES DIO], I don’t know what the problem is? Let’s just go out and celebrate Ronnie, it’s what we do. I know Ronnie liked me and he liked the guys in my band, that’s really all that matters. You know LAST IN LINE came through my town and unfortunately I was out of town, otherwise I would have been there and I would have hung out with the guys! There’s no question about it, I saw their new video and I love that song. No problems here, it is what it is. 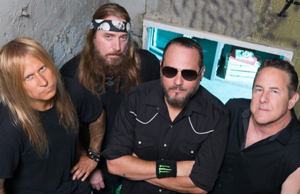 KNAC.COM: I saw you at El Corazon when you were in ICED EARTH and you performed “The Gettysburg Trilogy”. What did you have to do to prepare to do that night in night out on that tour? It was even more epic to see that done live. OWENS: We did a lot of preparation to get than done to the best of our abilities. That was a great time, performing that from city to city, what a great record! There’s no question I had to take care of myself and be at the top of my game to perform “The Gettysburg Trilogy” for sure. KNAC.COM: I was watching the ROADRUNNER UNITED DVD a couple of weeks ago and one of the highlights is the performance you did of ANNIHILATOR’s “Alice In Hell”. What was that like, that note you hit and you extended it out for what seemed an eternity. KNAC.COM: Last one, favorite cover to perform or that you’ve recorded? OWENS: No question, “Imagine”. I haven't recorded it yet, but I do it live anytime I do any acoustic shows. I like doing my version of that because I inject a lot of power and a lot of soul into it.